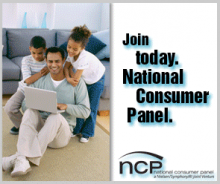 I’ve told you about Nielson several times in the past, but I just wanted to let you know that the Nielsen Home Scan Consumer Panel are accepting applications again! This is a really great opportunity for those of you looking to make a little extra from home. This is completely legitimate. I’ve been on the â€œwaitingâ€ list for a couple of months because our area is full but am really excited to try this out. I just need to get my scanner in the mail and I’ll be set! Basically, the Nielsen Consumer Panel will send you a hand scanner. You’ll then scan all of your purchases. Once a week, you’ll upload your scanner and send off your information. That’s it. All the while, you’ll be earning points for prizes. Not everyone will be accepted. They only accept a few applicants within each zip code. Apply today and find out if you qualify! They only accept applications until they hit their max. It only takes a couple days then we never know when we’ll see it again!